Warrens carved beneath sprawling municipalities, wickedly sharpened blades scavenged from centuries of corpses, the squeaks and scrabbling echoes of a language born of rodents, the musty and fetid scent of a black market hidden within the sewers, and the overflowing contempt of those who think they are better than the dwellers in the underdark - the ratfolk have always lived side by side with humanity, but only as cities grow have they become more noticeable, and harder to ignore. 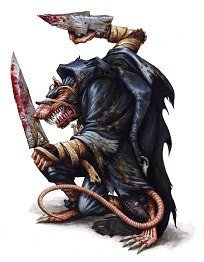 Ratkin are small, rodent-like humanoids; native to subterranean areas under cities and in dry regions. Typical ratkin average between four and five feet in height and weigh roughly 100 pounds. Most have brown fur, although this can vary greatly. 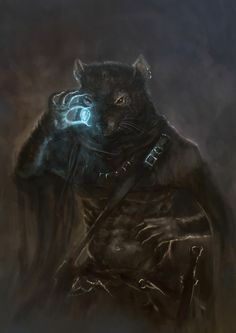 Black fur is looked upon as the sign of true strength, and in most cities a ratkin of black fur that is born on the night of a new moon is often taken by the Cult of Thanskachak to be raised as an assassin in service to all ratkin. It is not uncommon for lighter colored ratkin to dye their fur black. Albino ratkin are rare and considered a good omen. Albino, and white-furred, ratkin almost exclusively become clerics, sorcerers, and rulers over other ratkin. Ratkin have large fangs in the upper jaw structure, their eyes are commonly red, they all have over-grown claws, and a naked tail growing to almost a meter in length. 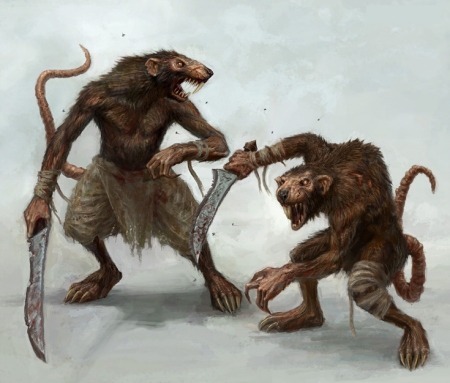 With scrawning arms and legs, and lackly greatly in terms of strenght, ratkin are naturally faster, more agile, and natural diggers. Due to their cowardly nature, ratkin will most likely run then engage in direct conflict. Only when cornered will a ratkin fight with a reckless abandon. 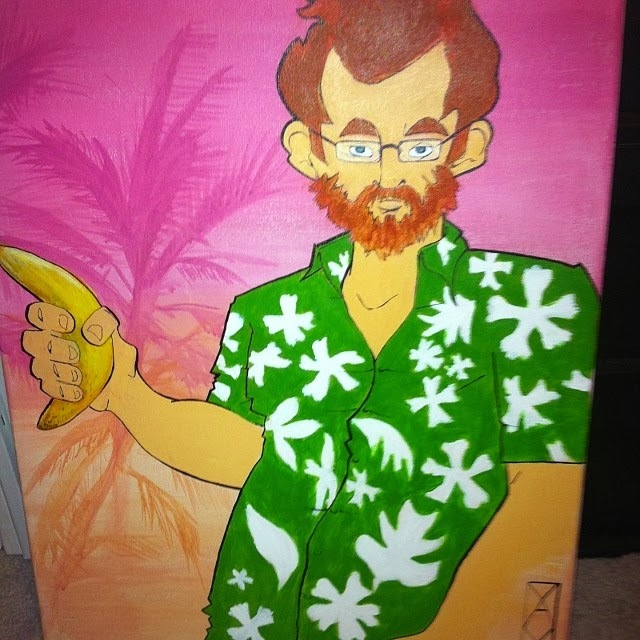 Ratkin are hoarders by nature, and as a whole are masters of commerce, though some are shrewd merchants who carefully navigate the shifting alliances of black markets and bazaars, many ratkin love their stockpiles of interesting items far more than money, and would rather trade for more such prizes to add to their hoards over mere coins. It's common to see a successful crew of ratkin traders rolling out of town with an even larger bundle than they entered with, the whole mess piled precariously high on a cart drawn by giant rats. They often wear robes to stay cool in the desert or conceal their forms in cities, as they know other humanoids find their rodent features distasteful. In the cities ratkin cling to the shadows and rarely venture out during the daytime, and in the bigger metropolitan areas there is always a secret ratkin marketplace which is literally underground. Ratkin have a strong attraction to shiny jewelry, especially copper, bronze, and gold, and many decorate their ears and tails with small rings made of such metals. 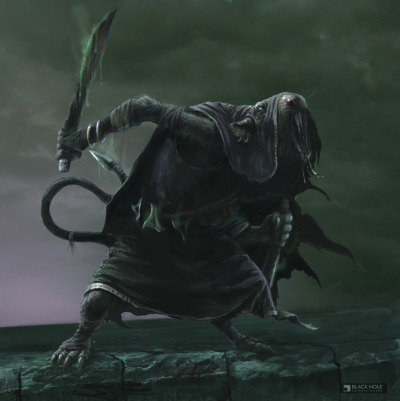 Ratkin thrive within the sewers underneath most human cities and larger towns, where they tend to maintain black markets for the seedier sides of humanity. Larger population centers house entire secondary communities of ratkin living side by side with humans. Many civil engineers have found extra tunnels and passageways added to their handiwork months, and sometimes only days, after finishing construction. Whatever wealth doesn't come to ratkin through trade arrives from scavenging or thievery. They dislike daylight, so many enterprising ratkin forge alliances with humans or halflings to handle larger or more legitimate trade negotiations above ground. Humans and halflings are always welcomed in ratkin warrens, but other races are given a cold shoulder or asked to prove their friendship, if not outright denied entry. Ratkin are extremely communal, and live in large families where the mother is almost always the head of household. Ratkin share both a high birth rate and infant mortality rate, a typical litter can range anywhere between 6 to 18 infants, roughly half of whom will die during infancy. Women amongst the ratkin think of childbirth and motherhood as a solemn duty, to be unable to bear children is the worst fate to befall a female ratkin. Most ratkin are lucky to survive birth and childhood, and the rest are lucky to know who their father is. Any ratkin who can accumulate vast wealth is often given a kind of governorship over other ratkin, and while trade is important for ratkin survival they don't regard it as a very honorable profession. Warriors are valued over all, and the ratkin who protect their tunnels are always honored with free food and celebratory greetings. It is rumored that the ratkin have tunneled passageways between every major city on the continent, and have ways of traversing these burrows faster than non-ratkin would be able to. Each ratkin community is autonomous and doesn't answer to any other ratkin leader elsewhere, or refuses to. It would be common to see ratkin traveling either on their own or in small packs. The ratkin population is constantly growing, only to decrease drastically during times of starvation. However, in times of plenty, when a ratkin warren grows overcrowded and the surrounding city won't support a larger community, young ratkin instinctively begin to fight against their elders rather than seek out new places in which to live. These ratkin revolutions are often bloody but brief as new and younger ratkin dethrone the established elder ratkin. As such, ratkin society cannot be trusted to remain stable, but it can be relied upon to be present. Ratkin are often driven by a desire to seek out new opportunities for trade, both for themselves and for their warrens. Ratkin adventurers may seek potential markets for their clan's goods, keep an eye out for sources of new commodities, or just wander about in hopes of unearthing enough treasure to fund less dangerous business ventures. Ratkin battles are often decided by cunning traps, ambushes, or sabotage of enemy positions. 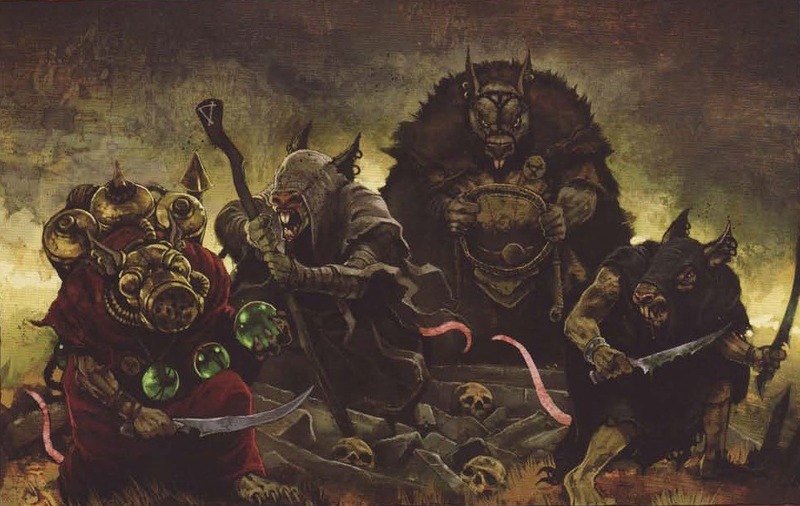 "The Thirteen" is a misnomer since Ratkin have fourteen gods they venerate. 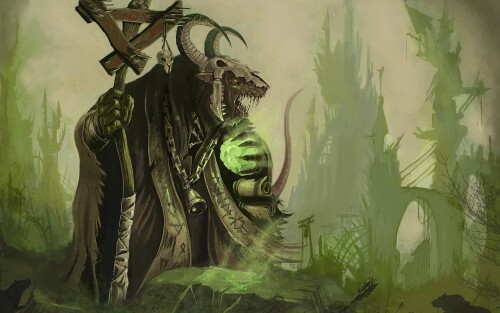 The Horned Mother is the first ratkin, and she is never openly worshipped, nor are shrines or temples ever dedicated to her, but every ratkin will speak her name in reverence and those that blaspheme the Horned Mother are often brutally killed. The thirteen other gods are her children, and the most prominent to be offered prayers or servitude and often referred to as "the Siblings" having been birthed by the Horned Mother. Age: Ratkin age at the same rate as humans. Size: Ratkin are shorter than most humans but are still considered Medium sized. Speed: Ratkin have a walking speed of 25. Darkvision: Ratkin have superior vision at night and underground. You can see in dim light within 60 feet of you as if it were bright light, and in darkness as if it were dim light. You can't discern color in darkness, only shades of gray. Ratkin Senses: You have proficiency in the Perception skill. Languages: You can speak Common and Ratkin. If there is a written Ratkin language in your region then you can read it as well. The Ratkin language has as many dialects and variations as Common might, and the two often mimic each other in regions where both are spoken. As a rule of thumb, if the humans of an area speak a variation of Common that counts as a separate language then the ratkin of that area also have their own separate version of Ratkin. Swarming: Ratkin are adept at swarming over foes during combat. When Ratkin fight alongside an ally, they can Help their ally as a bonus action. Ratkin Tenacity: Ratkin gain advantage on any rolls to resist poison or disease. Weight Modifier: x (3d8) lb.